This video will show you how to measure for your custom grip as well as introduce a few features you can incorporate into its design. Additional details for measuring for a free pistol are below. Customers interested in a custom revolver grip should click here. ​When you've got your measurements, you are ready to order your custom grip. Here is another view of the same measurements. The most important point to locate is the intersection of line 2 and 3. This is where the top rear of the palm shelf should come back to. Measure only with your hand holding a grip, not just your hand alone as in the picture. 1. How tall are your three fingers under your trigger finger? 2. Distance from the front of the grip face (underneath your little finger) back to your wrist break, i.e. the point where your hand meets your arm, not the back of sample grip shelf itself. Look for the circle on the hand on the left. 3. Distance from your wrist break up to the furthest point on the gun or grip under the spur that compresses your thumb webbing. This is a “soft” measurement determined by how much you prefer (or can tolerate) having your thumb webbing squeezed allowing placement of your hand as close to the bore axis as possible. Don’t squish it. It should be comfortable. If you are ordering a free pistol with a wrap around grip, there are two additional measurements needed. 4. The thickness of your hand at the knuckle of your middle finger. That is the knuckle at the top of your hand where it is the thickest. Don't squeeze the calipers to measure this. Look for the square on the hand on the left. 5. The width of your hand, laid flat across the back of your hand, at the knuckles, not including your thumb. The easiest way to get the first three measurements is to adjust a grip with a palm shelf to your hand and then take the dimensions using calipers and the adjusted grip. It doesn’t need to be a grip on your own gun, but if the grip frame angle is close to the gun we’re making a grip for we will get a better fit. 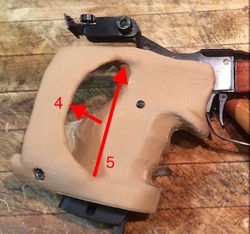 That is, don’t take measurements off a free pistol grip with a very shallow angle and cocked wrist and expect those measurements to transition well to a 1911. Presuming your hands are reasonably symmetrical left to right (as most of us are) you can do this with whatever handed grip is most convenient. If you don’t have a sample adjustable grip to take measurements from, you can measure your hand using stock slab grips. Just have a friend help so you can hold the gun in your preferred shooting stance while they take the measurements. This is particularly important when establishing measurements nos. 2 and 3.